Still stuck? Check out DoubleJump's Little King's Story Official Strategy Guide! 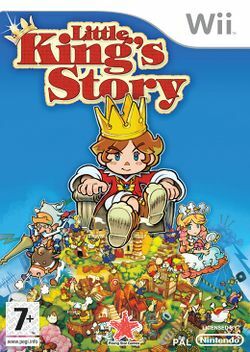 Little King's Story (王様物語 Ōsama Monogatari) is an RTS co-developed by Town Factory and Cing for the Wii and later released for Windows. The game will be published by Marvelous Entertainment (MMV) worldwide, MMV USA and XSEED co-published it in North America and MMV subsidiary Rising Star Games published the game in Europe. The game was released on April 24, 2009 in Europe. The player character is a timid boy who has found a mysterious crown which gives him the power to charm people and make them follow orders. As king of the village, his goal is to expand the village and make his subjects happy. The design of the game combines various simulation elements as well as real time and adventure elements. This page was last edited on 10 July 2017, at 11:35.